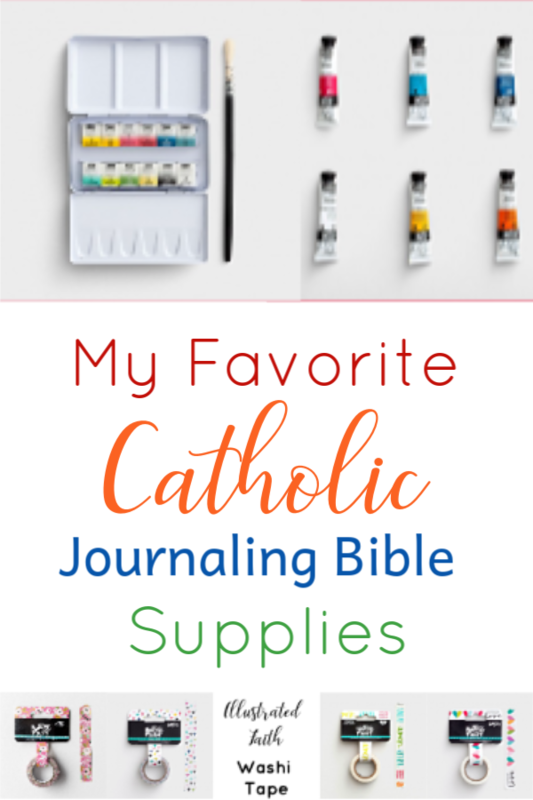 Now that there is a Catholic Journaling Bible and more and more women are considering taking up this spiritual discipline, I thought it would be fun to share some of my favorite Catholic Journaling Bible supplies. Of course, I’ll include my favorite pens and highlighters. But I think you just might be surprised by at least one of my favorite Catholic Journaling Bible supplies! I have tried a lot of pens…like so many different pens it’s not even funny. Amazon is probably like, “What does this chick do with all the pens she buys?” They don’t even know about the pens I buy in the stores, or the free hotel pens I’ve collected from four years of soccer mom travel. Back to my favorite pens, I have two. The reason is one set is gel and sometimes they bleed or leave a heavy shadow depending on the Bible pages. The other set is just regular ball-point. The ballpoint doesn’t bleed through and rarely shadows to the other side even with the thinkest pages. Another purchase Amazon probably wonders why I purchase in mass quantities is highlighters. I’m a touch picky when it comes to highlighters. Of course, there’s the obvious concerns of bleed through and shadowing, but then there are the whole color and texture issue. Some highlighters are too dark while some are too pastel. Some are too heavy, too waxy, too skinny, too thick…I know, Goldilocks has nothing on me and highlighters. 2018 has been a great year if for no other reason than I have found my forever highlighters. And the price is amazing! I use these in my Bible Journaling, planners, calendars, and books I’m reading. There’s only one set of colored pencils I love to use in my Catholic Journaling Bible; part of the reason is entirely practical. These colored pencils come in a variety of colors and are smooth across any Bible pages. Bonus feature, they don’t have to be sharpened! Surely I can’t be the only one who can never, ever, in a day plus two find a pencil sharpener? When my Bible Journaling time is limited I can’t waste precious minutes looking for a pencil sharpener. I’ve tried a few different watercolors from the cheapest of the cheap we have all bought our children at one time or another to more expensive ones I needed help choosing from the craft store. I like the Illustrated Faith watercolors. They just “feel” like they were created by a Bible journaler for Bible journalers. I started off with some acrylics I purchased from Hobby Lobby and although I like them, the tubes are way too big. It will take me forever and a day to use them up. I’m deferring to Illustrated Faith again. These are just the right size and the colors are lovely. You can buy washi tape anywhere now! And that’s a great thing! I’ve purchased washi tape at Walmart, Target, Hobby Lobby, Michaels, Amazon, Blitsy (some of my favorite), and of course Illustrated Faith. Stamps are so much fun to use in the Catholic Journaling Bible. Especially for Catholics, Look to Him and Be Radiant has some of the prettiest Catholic stamps around. You can find stamps at craft stores and Illustrated Faith. I also really like an Etsy shop called Growing Meadows. And I prefer the clear stamps that you use a stamp block with as opposed to the wooden stamps. I feel like I have more creative freedom in placement doing it that way. I have purchased stickers everywhere from Dollar Tree to Illustrated Faith. Your purchase of and use of stickers will just depend on your personal preference. Since we’re talking about Catholic Bible Journaling I do lean more towards faith-based stickers. I like the Bible Journaling Kits from Illustrated Faith because each month’s kit has it’s own theme and coordinating stickers. I struggle with Bible tabs. I like the idea of them and I like the look of them but sometimes I feel like they get in my way. I have a child who LOVES them and doesn’t understand how I could think they get in my way, lol! So really an individual decision. There are a couple of Etsy shops that have some pretty ones that are Catholic, meaning they include all the Books of the Bible. If you’re crafty or so inclined, you could make your own using scrap paper. You can hand cut them or purchase a tab punch from a craft store. I love Simple Stories, Project Life, and Me & My Big Ideas Cards for extra journaling space in my Bible or using as bookmarks. They immediately provide some lovely character to your own Bible Journaling style! I also like writing Scripture verses on them to memorize or carry with me to read on the go for a quick pick me up and encouragement boost. They can also be given away for the same purpose. This is a new favorite and by favorite, I mean favorite purchase I’ve made in 2018 for my Bible Journaling, Prayer Journaling, and planning. I am forever leaving little life notes in the margin of my Bible. These are not theological or meditative, they are exactly what they are, life notes. I might put a date next to a Scripture and make a note that I was on vacation when I read it. I might write the names of one of my children next to a particular passage I might be praying for them or that reminds me of them. Now I can add a photo in the margin or on a Journal Card and Washi tape it on that page in my Bible. I mentioned in my Bible Journaling Tips, Inspiration, and Permission Ebook that I see Bible Journaling as creating a Bible legacy for my children, the addition of 2×3 phots just takes that desire to the next level! So there’s my comprehensive Catholic Journaling Bible supplies list. This list is subject to change as I find new and more favorites to add to it. If you have dipped your toes into Bible Journaling, what are some of your favorite supplies?